Many happy with it once you get off this forum Tony . Many were happy with their Big Wheel before they got their Huffy. Look at the 100’s of threads in this section of the forum, education is more important than toys… umm… tools. You could buy a $30,000 IR camera, but if you don’t know how to use it you may as well get a pair of X-ray glasses. Bob was that necessary running members off the forum. What do you want to do with a C2 thermal imager? If you’re looking at compact thermal imagers, you might consider the Seek Reveal Pro. Way higher resolution for not much more $. My budget tops out at $700 for this purchase. Primarily, I am looking to identify water penetration. Took this Tony…feel free to call me away from the Vultures . Nice picture of a glass of water. How is that supposed to help anyone looking to locate an unknown water source in an unknown location? If you are looking to have a thermal imager that serves as an adjunctive tool to your home inspections, you may find the C2 to be adequate to your needs. Keep in mind that this imager is an entry level instrument that does not meet published standards due to its relatively low resolution. The C2 is designed to provide imaging of sizeable targets at nominal distances. Examples would include, but not be limited to: walls, ceilings, doors, and windows of a home; wall and floor areas around sinks, toilets, and bathtubs/showers; radiators and HVAC vents; and electrical panels and devices. Physically try the imager under the same conditions you will likely encounter in the future. Consider taking an infrared training course before making an equipment purchase. Doing so will expose you to other applications that you may not have considered as well as how to turn thermal imaging into a significant revenue stream. With a quality instrument and effective marketing, a qualified thermographer can gross in excess of $200,000 annually. Normally priced at $995, Infrared Inspections for Home & Buiding Inspectors is available to InterNACHI members for only $295. Because it is a web-based course, you are able to take your training 24/7 from the convenience of your home or office without incurring travel expense or losing billable time. You are welcome to contact me directly should you require additional information. My numbers are listed below. Looks like someone upgraded to a Seek Reveal Pro. It’s more, better for finding wet footprints in front of the shower door so that a special, self-trained operator can identify them as a gasket leak in his report. Wha! You makin’ stuff up? I’m still waiting to see my first shower door that has a gasket. Now that is an excellent example Bob! A perfect example of stupidity in IR! 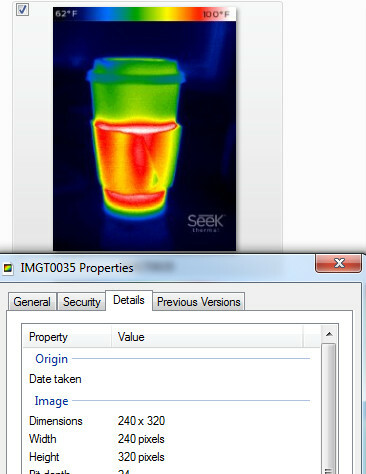 Thermal imaging cannot “see” through glass (or other opaque materials)! So there you have it. You did not identify water. OP-this is a perfect example of indirect measurement. You are seeing the effects of the water not the water. If you get a camera without any training you’re going to go look for something “blue”. Blue does not mean “water”. Blue, simply means something at a lower radiated energy than other objects in the field of view of the camera. It is up to you to identify specifically what the thermal anomaly is, thus the recommended training. If you notice, I said “indirect measurement”. The majority of thermal imaging done on buildings consists of “indirect measurements”. Moisture will not be as obvious as Bob is trying to portray in his glass of water. If your camera is not sensitive enough, the only thing you’re going to see is gross water leakage (which will likely show up visually anyway). So it is not very important to have a thermal imaging device to conduct your home inspections. Especially if you don’t know how to use it. Is this moisture, or air? Hint: it tested as elevated moisture with a moisture meter. It takes more than a thermal camera and a moisture meter to identify the difference between air and water. Thermal imaging cannot “see” through glass! So there you have it. You did not identify water. If you get a camera without any training you’re going to go look for something “blue”. Blue does not mean “water”. Blue, simply means something at a lower radiated energy than other objects in the field of view of the camera. It is up to you to identify specifically what it thermal anomaly is, thus the recommended training. Again Tony the NACHI forum is full of insulting keyboard warriors and you just met them…check the same names chasing and insulting everyone from past threads and see. Many of the best Inspectors across the country use C2 and Flir One to help detect and prove …They simply do not splash the pretty rainbow colors all over their websites and overcharge everyone for aiming a camera is all . You will not see these same goofs on any FB groups yacking away for self gratification for a good reason . P.S last week went out with one of the most well known Thermographers in the business and saw the same stuff he saw with a much more expensive model camera …Go figure .